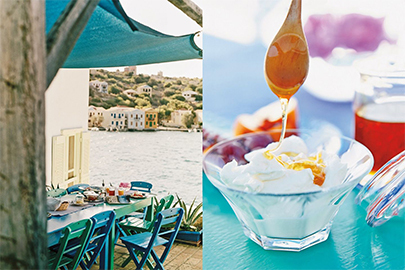 Welcome to Marie's Mediterraneo Kastelorizo. 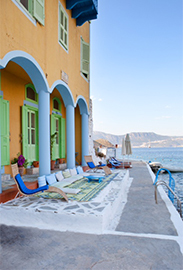 edge of Greece, on the picturesque little island of Kastellorizo. 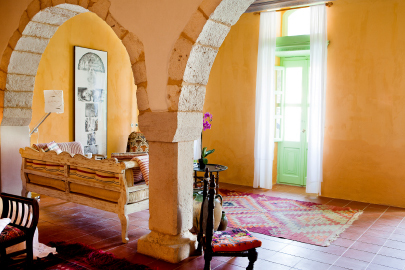 a wonderful blend of Turkish and Greek influences. 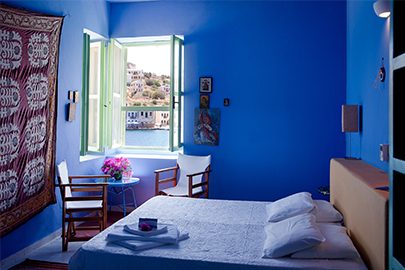 Mediterraneo Kastelorizo Hotel is on the waterfront of Kastellorizo - the easternmost Greek island, which has the convenience of its own airport. 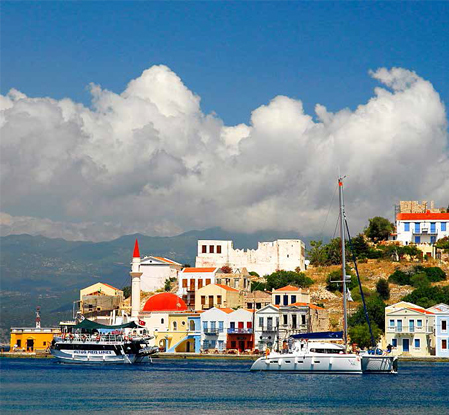 The island is also connected with Rhodes, Piraeus in Greece and Kas in Turkey by regular ferries. 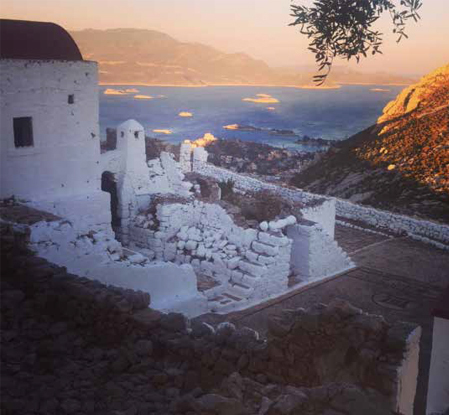 There is only one road that connects the Airport to the center of the Kastellorizo village which you can reach by taxi or a small bus. From here you can take readily available sea-taxis to the Hotel. 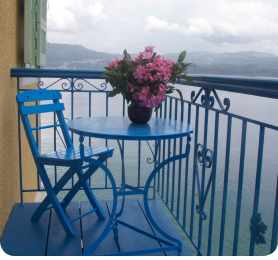 The Hotel is also 20 minutes away by boat from the southern coastal town of Kas in Turkey. 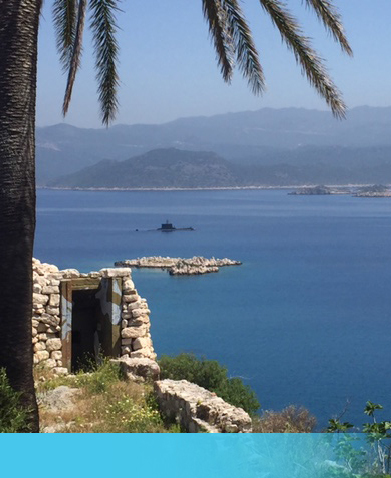 - Fly to Dalaman or Antalya airport and then go to Kas by car (2 hrs drive). 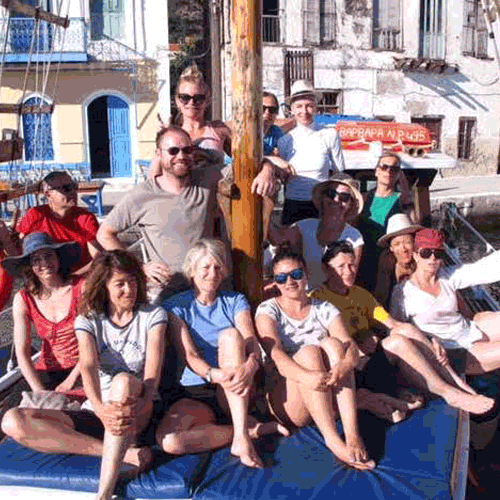 - Kas to Kastellorizo : 20 mins by boat (every morning during season). 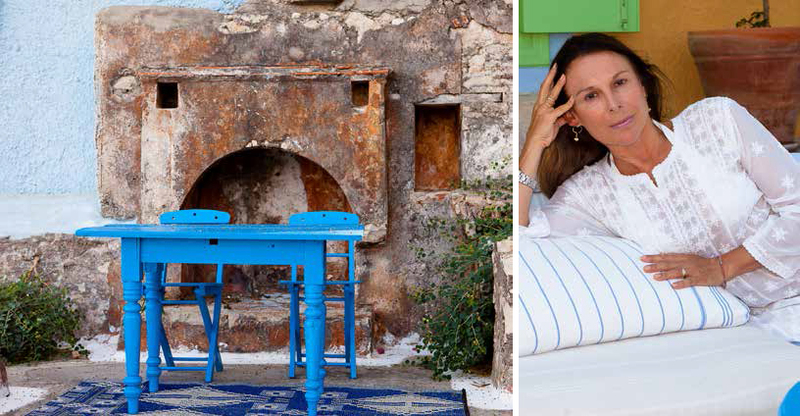 Kastellorizo made Parisian architect Marie Rivalant fall in love three times: First with the island of Kastellorizo, then with a greek man living there and finally with an old, waterfront mansion. So she bought the mansion, moved to the island and married the man. 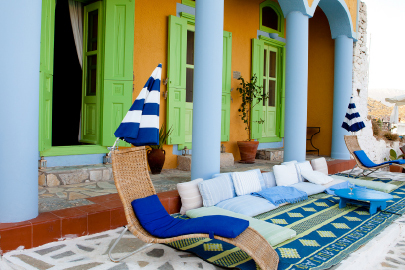 Luckily for us, she decided to turn the mansion into one of Greece's most charming boutique hotels. 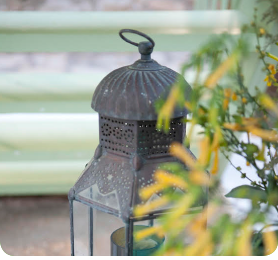 Marie has created a delightful little haven with seven vibrantly coloured bedrooms, some of which look over the harbour and a sunbathing terrace on the quayside. 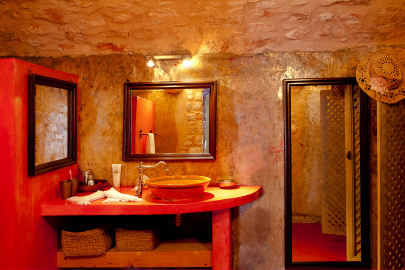 A magnificent suite occupies the ground floor, where you can step out and dip right into the inviting aquamarine waters. 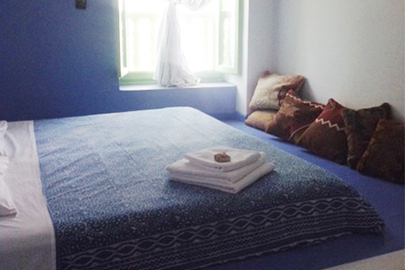 Its simple unpretentious atmosphere is what makes Mediterraneo Kastelorizo so special. 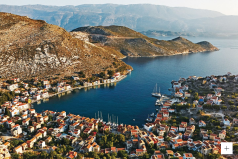 Kastellorizo (or Megisti as it is called in Greek) is arguably, one of Greece's best kept secrets - although this apparently hasn't stopped Prince Charles, Phil Collins, David Gilmour, Demi Moore, Michael Douglas amongst others to visit the beautiful island. 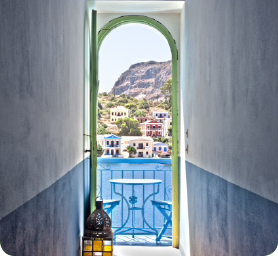 Surrounded by the jewelled turquoise waters of the Mediterranean Sea, Kastellorizo allows you to experience island life and its neo-classic architecture in all its charm. Cobblestone alleys and traditional colourful mansions dot the scenic village. 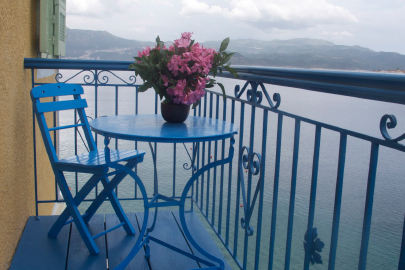 The waterfront is lined with tavernas and café-bars that spoil you for choice. 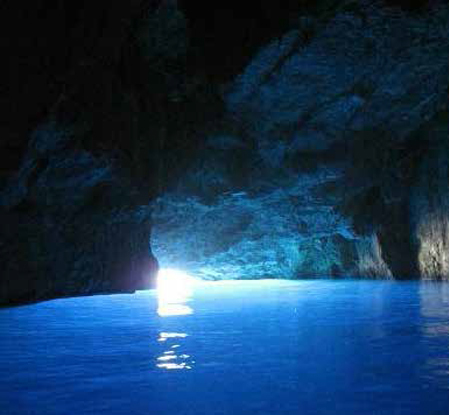 The island's big "must-see" sight is its Galazio Spilaio (Blue Cave), the biggest and most spectacular of all sea caves in Greece. It is known worldwide for its rich "decoration" of stalactites - truly a nature's magnificent work of art. 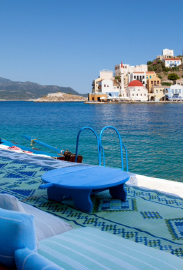 In Kastellorizo, you do not have the typical golden Greek beaches but you can dive into the crystal clear waters - and get to swim with sea turtles. 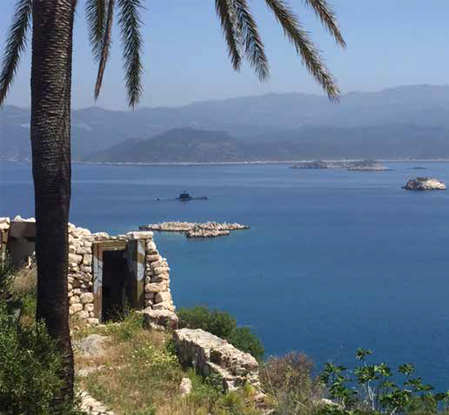 Faros - the pictureque 'lighthouse bar' has specatacular location and provides diving platforms and deck chairs to swim, relax and take in the beauty of the harbour. On request, special meals made from seasonal ingredients and fresh catch are prepared with passion and pride, and served to you and your guests on the terrace. 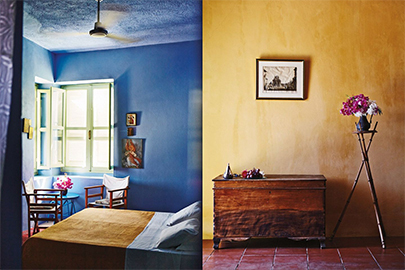 Marie added colour, tastefully decorated the seven private bedrooms giving the airy rooms, spread over two levels. 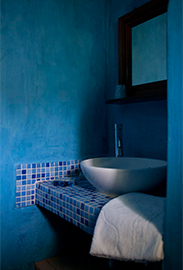 On the ground floor is a magnificent suite that opens out into the azure waters of the Mediterranean. 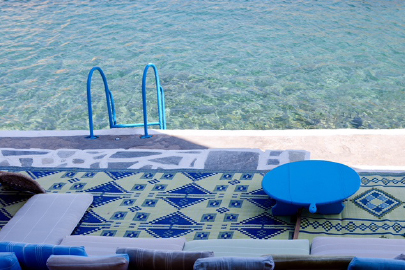 A bathing ladder takes you & your family into your own private infinity pool, the turquoise hued Mediterranean Sea. Sun beds are available for soaking up the sun after a refreshing swim. 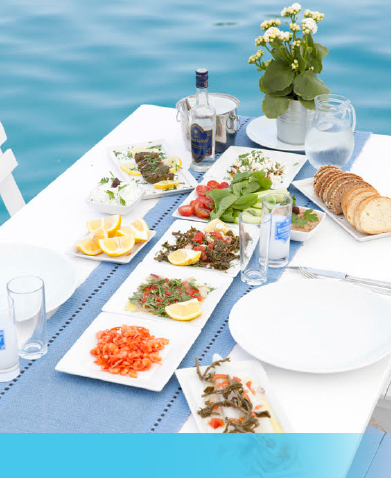 Mediterranean Breakfast with multicultural influences of Turkish, Greek and French delicacies is prepared with yoghurt, nuts, homemade preserves, cheese and freshly baked bread. 2 nights deposit by electronic bank transfer. Overnight taxes of 0,50 €/ room/ per day to be paid extra. All other taxes included in room rate. Please note that if you do not reach the Hotel on your booked dates - we will not be able to refund or alter your dates of reservation. The Hotel does not take responsibility for delays in reaching the island/hotel. 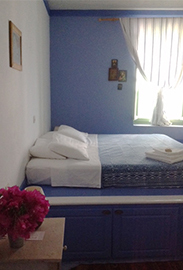 If you would like to extend your stay in the hotel, we will try our best to make accomodation for you. We do not accept bookings over the phone. The Craft Collection Shop stores exotic and natural home decor textiles - bedspeads, tablecloth, pillow cases, ceramics, glass, jewellery. There is also both comfort clothing and fashion wear - all personally handpicked by Marie from France, India, Turkey, Greece and others during her travels. All the Hotel decor, room linen, curtains, wall hangings, bathrobes, hats etc are part of this Craft Collection. We do not provide yoga mats or yoga accessories. Please bring your own yoga mats. 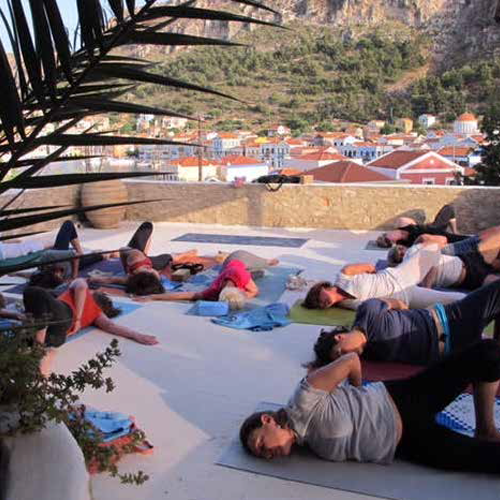 We welcome experienced yoga teachers to come and stay with us and host Yoga Retreats (upto 18 people) at our Shala for the months of May/ June & October 2018. 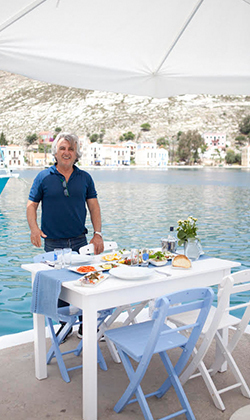 Located right in the midde of the harbour and on the famous wharf of Kastelorizo - Lazarakis is well known for its fresh sea products... you can also taste many Greek specialities 'mezedes' at Lazarakis. 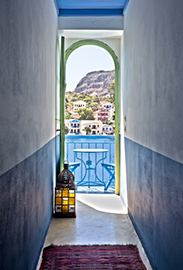 When father Paraskos Lazarakis came back from Africa after the second world war, he opened a small taverna in Kastelorizo in 1947. Today, the restaurant has grown to accomodate upto 70 people and is managed by the son - Giorgios Lazarakis...whilst the family continues the tradition of serving good food. Also managed by Giorgos Lazarakis, Faros Bar occupies an enviable location in the former lighthouse of Kastelorizo, beyond the ferry jetty and beside the mosque, Faros bar offers a wonderful opportunity to swim in turquoise shallows - before taking breakfast and drinking in wide-screen views of Turkey. It even has its own quayside loungers. Salads and snacks all day, then tapas from 6pm. We can host events upto 25 people for a party, wedding or special occasion at our Hotel. We can assist in accomodation and theme planning for the event. 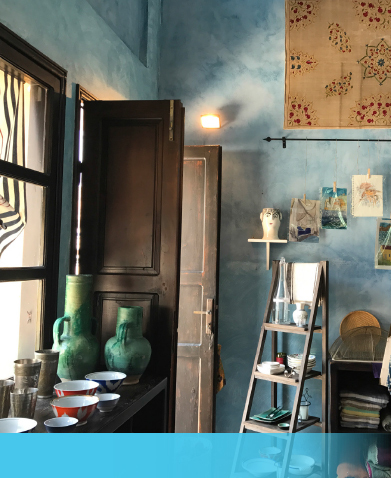 We had spent a few days at Mediterraneo last year and kept day-dreaming about the view from our room, the relaxing atmosphere and the finest hospitality by Marie, Ismael, Natalie and Alayna. The picture perfect port of Kastellorizo was in full display from our window. After the rich breakfast and the outstanding service we would dip in the water, literally two steps from our door. We loved watching the sea turtles sticking their heads out of the Southern Aegean to catch a breath. At night, we would lounge in the chaises looking at the stars. 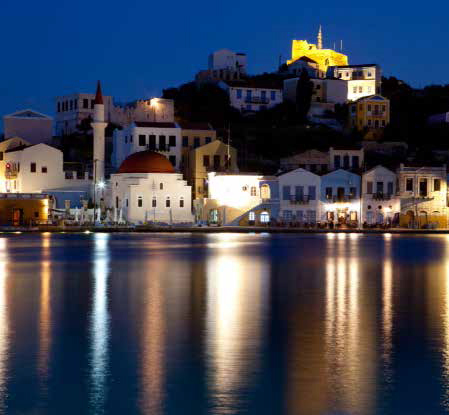 What a treat it was catching the full moon of September in our beloved Kastellorizo. We cannot wait to see you again dear friends! 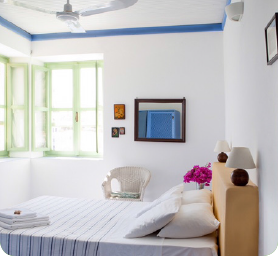 The boho-chic boutique hotel has Turkish accents and a marvellous waterfront location right at the entrance to the harbour. 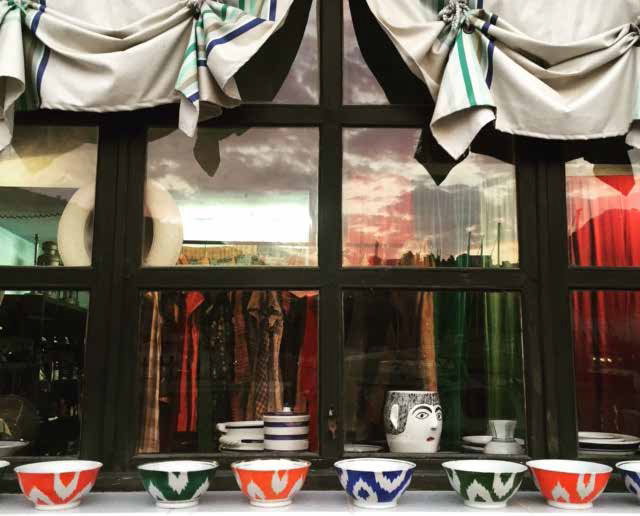 Gorgeous print bathrobes, which French owner Marie Rivalant also sells in her boutique, are provided for swimming, straight off the terrace. 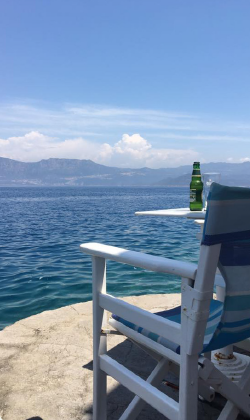 Lazarakis - This is a long-time favourite with locals and yacht owners who step straight off their boats into a taverna chair. Yorgos, the owner, who is the husband of Marie Rivalant, owner of Mediterraneo, offers home-cooked Greek dishes with a good wine selection. 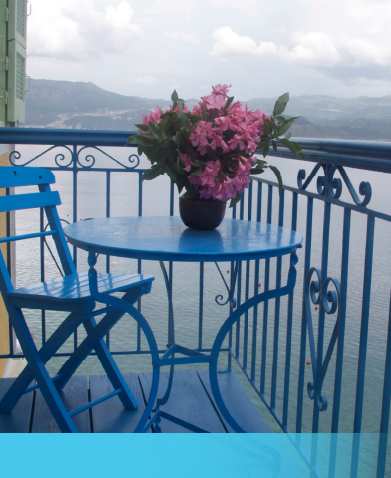 The place to stay is the Mediterraneo groundfloor suite, one of the old waterfront mansion into a colourful haven, with bedrooms looking out over the harbour (though the groundfloor suite is the best) and a sunbathing terrace on the quayside. It doesn't have a pool, but a bathing ladder drops you into the aquariumclear sea, where tiny, rainbow coloured fish swim around your toes. There is no à la carte restaurant or bar, either, but breakfast is a lavish Levantine affair of yoghurt, island honey, nuts, homemade preserves, cheese and freshbaked bread - and with a chain of tavernas and cafèbars all around the waterfront, there is no need to eat at the same place twice. Our stay was wonderful.The rooms are very beautiful decorated and the beds are very comfortable. But the best things are the breakfast and the wonderful location on the end of the quay.Breakfast is serviced on a terrace and had a lot tooffer, bread, croissants, marmelades, cheese, tomatoes, omelettes,fresh orange juice etc. But waking up in the morning, the view over the sea and village should make everybody happy.It is a lovely relaxed island (maybe more partying in high season) with superb seafood restaurants. 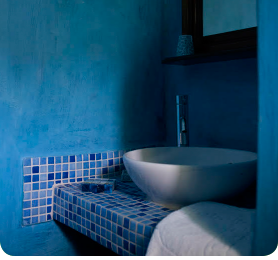 Go there!And stay in the only hotel with personality (thanks to the french owner/ architect Marie):Mediterraneo! 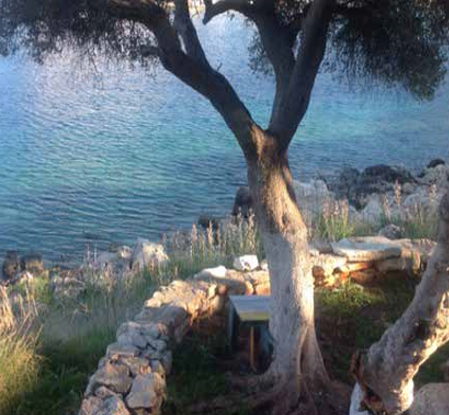 On this magical and undiscovered island of just 252 habitants, lies the Megisti Hotel. 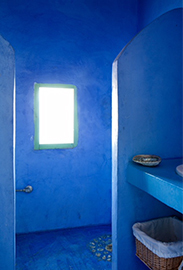 Designed by the French architect Marie Rivalant. 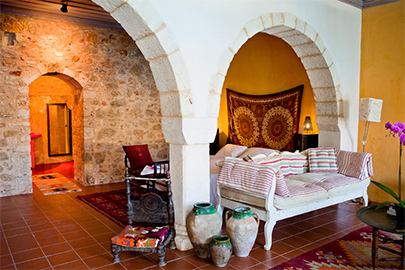 The hotel is an ottoman style house, in absolute harmony with the islands breathtaking natural surroundings, the Megisti Hotel holds a spectacular location on the island, almost built into the sea. 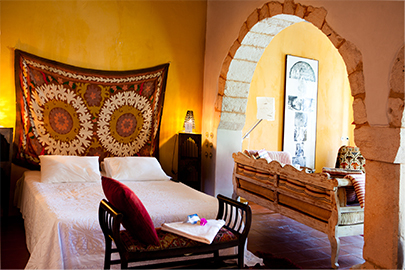 Following its major renovation in 2008-2009, the hotel is purely a destination itself. 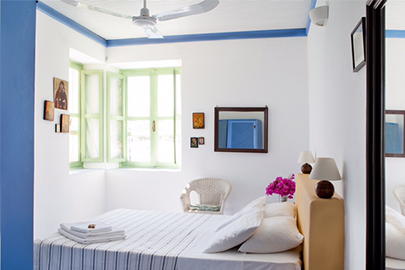 Stunning views of the ocean, crystal clear waters, comfortable stylish rooms. It is still a hidden place, to discover!